The citadel in question belonged to Suddenly Spaceships [CYN0]. The alliance had been living in the region for quite some time. With Pandemic Horde [REKTD] expanding its territory, inheriting some of the sovereignty in the region held previously by Brave Collective [BRAVE], the two alliances signed a non invasion pact. Since then the relationship between the two entities had steadily deteriorated, resulting in a breakout of hostilities as Pandemic Horde pilots started targeting Suddenly Spaceships’ infrastructure. The two alliances clashed in many skirmishes throughout the month as Pandemic Horde continuously escalated matters. Finally a Pandemic Horde fleet, backed by Mercenary Coalition [MC], reinforced Suddenly Spaceships’ staging citadel in 6-4V20, prompting the fight. 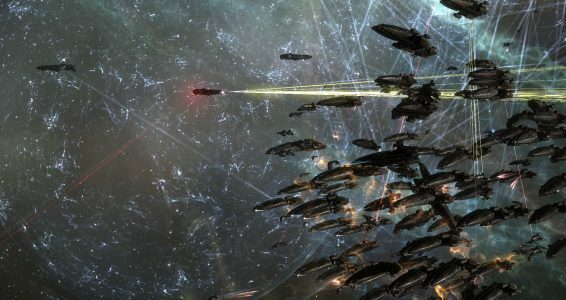 With Pandemic Horde involving other groups in the fighting and already being severely outnumbered from the outset, Suddenly Spaceships searched for allies throughout New Eden. It managed to find many willing alliances and coalitions to help defend its citadel. The following groups flocked to Suddenly Spaceships’ aid; Goonswarm Federation [CONDI] with a Cerberus heavy assault cruiser fleet, The Initiative. [INIT.] with a Machariel battleship fleet, Triumvirate. (TRI.) with a Gila cruiser fleet, Snuffed Out [B B C] and Project.Mayhem. [16-13] in a joint Nightmare battleship fleet as well as Out of Sight. [OOS] and Bombers Bar which each brought squadrons of stealth bombers. Suddenly Spaceships itself organized a Proteus strategic cruiser fleet which later merged into The Initiative.’s fleet. Against them, Pandemic Horde had a myriad of allies arrayed to reinforce the citadel a second time. Besides the alliance fielding a Maelstrom battleship fleet with several dreadnoughts used to reinforce the structure, the following coalitions and alliances brought fleets to participate in the attack; Northern Coalition. [NC] and Guardians of the Galaxy (GotG) each brought a Machariel fleet to the fight while GotG had a secondary Proteus fleet with it. Mercenary Coalition and Pandemic Legion [-10.0] also fielded separate Proteus fleets. In addition, Northern Coalition. had advanced its super capital fleet, bringing it near the region to stifle any chance of a capital escalation. It took a while for either side to set up in the system. With many of the combatants living several regions away, some even deployed half way across the universe, scouts were sent to chart wormhole routes. One by one the different fleets started making their way towards 6-4V20. Due to Cloud Ring’s unique topography, many hostile fleets encountered each other en route. Neither side wanted to engage too early, leading to one of the fleets dropping behind to keep distance, thus creating further delays. First to set up in the system were the attackers. 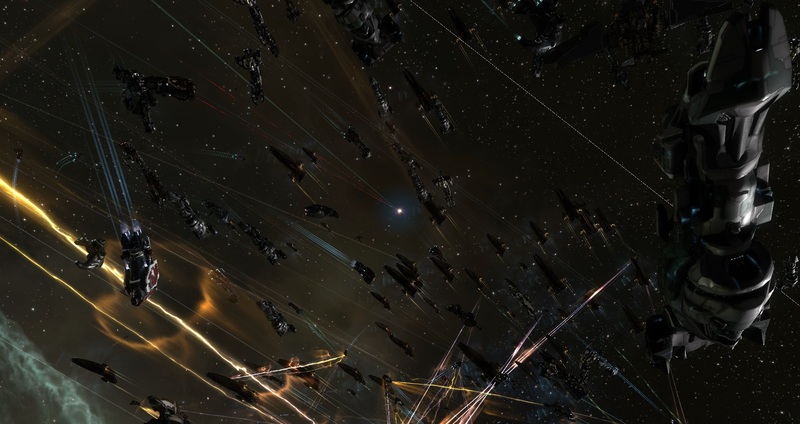 The GotG fleets together with Pandemic Horde warped towards the Fortizar, landing at a distance from the structure. The Maelstrom fleet had also brought three Phoenix dreadnoughts with it in order to bash the structure once it became vulnerable, allowing it to focus on the fighting instead. As the hostiles waited for the structure to exit its invulnerability phase and for reinforcements to arrive, Out of Sight. took the chance to score a bombing run on the Maelstroms. The battleships had spread out and had a warp disruption field covering their position, but the stealth bombers executed their run regardless, losing a few ships in the process. The damage done to the battleships was not severe, but still costly. Many support ships were destroyed in the attack, not to mention logistics cruisers and even mainline ships. It would be an ill omen for the attackers of what was yet to come. The first hostile fleet to be taken out of action belonged to Mercenary Coalition. Much like the other participants, its Proteus fleet was making best speed towards the system. As the fleet made its way, it encountered the Triumvirate. Gila fleet. Triumvirate. forces lacking intelligence of the hostile fleet’s composition, decided to hang back rather than confront the Mercenary Coalition force, allowing it to advance while shadowing it. As the two fleets arrived in O-0HW8 system, The Initiative. decided to attempt and cut off the Mercenary Coalition fleet. The Initiative. fleet waited for Mercenary Coalition to warp to the 6-4V20 gate where it immediately bridged. With the Mercenary Coalition fleet landing on the gate only to discover The Initiative. Machariels waiting for it, it had no choice but to jump through, followed closely by the battleships. In O-0HW8 in the meantime, the Triumvirate. Gila fleet was coordinating with The Initiative., warping to the 6-4V20 gate and setting up on it for the strategic cruisers to come back. Interdictors scrambled to keep both sides of the gate under a cover of warp disruption probes, pinning the strategic cruisers to the gate. With the strategic cruisers entering 6-4V20 , they found themselves uncloaking right besides the battleships. Not wishing to confront The Initiative. in a close range brawl, especially as it had a numerical advantage, the strategic cruisers burnt back towards the gate and jumped out only to find Triumvirate. forces waiting for them. The Gilas unleashed their swarm of drones and targeted the strategic cruisers which attempted to burn away from the gate and to freedom. The drones had little problem breaking through the strategic cruisers’ tough armor, especially as the Mercenary Coalition fleet was in disarray; The Mercenary Coalition’s fleet commander being one of the first casualties. At the same time, Northern Coalition. arrived to O-0HW8 and aligned to the 6-4V20, prepared to aid Mercenary Coalition. However the Proteus fleet did not communicate its distress, leaving the Northern Coalition. Machariel fleet idle. By the time the Northern Coalition. fleet commander learned of the situation, the Mercenary Coalition fleet was broken and in full retreat. Whats worse, other hostile fleets had gathered on the O-0HW8 gate in 6-4V20, blocking Northern Coalition.’s path. Not including The Initiative.’s Machariel fleet, Snuffed Out\Project.Mayhem. had arrived in the system, alongside Goonswarm Federation and the Suddenly Spaceships Proteus fleet and all four combatants set up on Northern Coalition.’s in-gate. To jump into the firepower arrayed there would have been suicide. 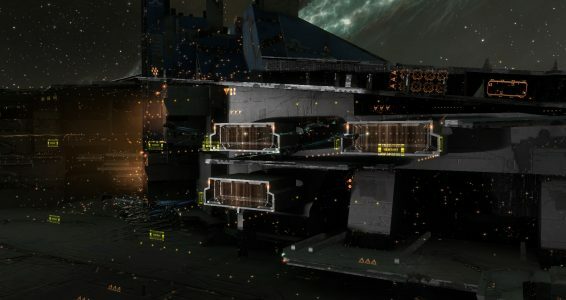 While the defenders’ attention was focused on the O-0HW8 gate, the Fortizar itself had exited its invulnerability mode and attempted to repair itself. However Pandemic Horde and GotG fleets which were still present in the system did not allow it to repair. The three fleets opened fire, slowly grinding down the structure’s hit points as Time Dilation shot up, reaching soul crushing levels. As the fleets persisted, managing to reduce the structure’s armor by 50%, the defenders responded. The various defending fleets warped in, The Initiative.’s Machariel fleet merged with the Suddenly Spaceships strategic cruisers and the joint Nightmare fleet landing in range of the GotG fleets which remained close to each other. The two defending fleets wasted no time in opening fire. The Nightmares burnt through mainline ships while The Initiative. set its sights on the command ships. In a few minutes, the GotG fleets had been deprived of all their links ships while also sustaining few casualties from the Nightmares. Quickly realizing the peril, the GotG fleets warped out to safety, leaving the Maelstrom fleet and its dreadnoughts alone in the field. The Maelstrom fleet stood its ground, exchanging fire with the two defending fleets which were quickly joined by the Goonswarm Federation Cerberus fleets. Within moments, the Maelstrom fleet found itself boxed in between the defenders who hammered it from every direction. Taking advantage of the defenders leaving, the Northern Coalition. fleet entered the system and prepared to enter the fray. Pandemic Legion, which had been shadowing the joint Nightmare fleet, had also took advantage of the fighting to enter the system and warp to the grid itself, landing at a great distance from the center of battle. It became quite apparent that the battle had become unsalvageable for the attackers. 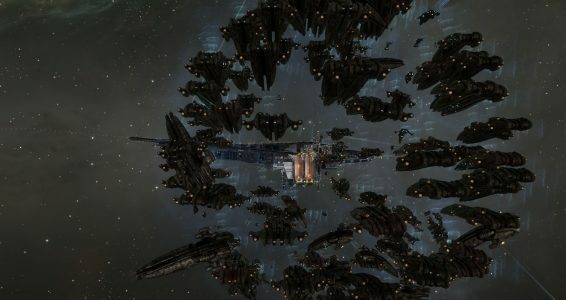 With GotG losing their command bonuses to Mercenary Coalition forced to retreat and Pandemic Horde getting trapped on the Fortizar grid, any semblance of coordination had disappeared. Instead, Pandemic Legion and Northern Coalition. used the opportunity to plan their extraction routes and abandon the fight. Pandemic Horde itself was losing ships left and right. Besides the three hostile fleets firing at it, the Fortizar itself kept bombing the battleships with void bombs, draining their capacitor and that of their logistics cruisers. Shield hardeners shut down while remote shield transfers refused to work as ships found their energy reserves depleted. Whats more, Bombers Bar continued to harass the battleships with more bombing runs. All this confusion resulted in the already weakened logistics wing of Pandemic Horde being completely overwhelmed. The only reprieve for the battleships came when the different fleets focused their firepower on the dreadnoughts. 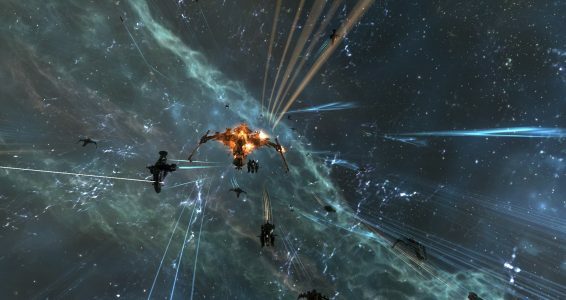 The three Phoenixes kept their focus on the Fortizar, chipping away at its health and pushing it towards its second reinforcement timer. With the main objective of defending the Fortizar seemingly in danger, the dreadnoughts were called primary and the three fleets proceeded to demolish them. It didn’t take too long for the defenders to destroy the capital ships, allowing them to return once again to the task of annihilating the Maelstrom fleet. The Maelstroms for their part returned fire, managing to inflict some losses on the defenders. Yet for every mainline ship they destroyed, they lost more than ten in return. This uneven trade grew ever bigger as the number of Maelstroms sharply decreased due to the defenders’ efforts. Within ten minutes of the Maelstrom fleet becoming primary it ceased to exist. With the dreadnoughts gone and the hostiles pushed out of the grid or annihilated completely, the Fortizar was allowed to repair itself without further interruptions. Once the structure repaired, it entered its scheduled invulnerability cycle, securing victory for the defenders who then attempted to chase some of the retreating hostiles, chiefly the Northern Coalition. Machariel fleet. The Machariel fleet however managed to delay the pursuers, losing only a few stragglers as it extracted back to its staging system. The other hostile fleets managed to withdraw without incident either, giving the defenders the opportunity to stand down and bring an end to the fighting. Battle report for the 6-4V20 and O-0HW8 systems can be found here. The battle itself saw 1,442 pilots in the 6-4V20 system alone. Time Dilation greatly fluctuated throughout the fighting, reaching upwards of 10% at times. Regardless it was a constant throughout the engagement. The fight itself lasted 50 minutes. The defenders lost a combined 69 ships including 2 battleships, 1 heavy assault cruiser and 19 cruisers for a total of 4.35 billion ISK damage. 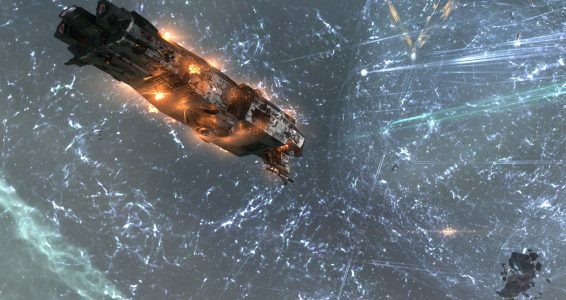 The attackers lost altogether 178 ships including 3 dreadnoughts, 65 battleships and 18 strategic cruisers for a total of 42.06 billion ISK damage. Your style is unique in comparison to other people I’ve read stuff from. Thank you for posting when you’ve got the opportunity, Guess I’ll just book mark this web site. 7wHRts You, my friend, ROCK! I found just the info I already searched everywhere and just could not find it. What an ideal web-site.